Yes! We do still process film! We still process C41, Black & White and E6 film, here, in house. We can Print your film by machine or by hand. We even offer Fiber printing & toning for your Black and Whites. We can even Scan your film and provide you with digital images and digital prints of virtually any size imaginable. All of our film processing is done on Rack and Hanger (Dip and Dunk) systems, to assure the safest handling of your film. You can drop by to see us, or use our night drop box, or even mail your film in for the best quality service available. 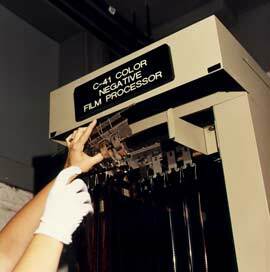 All film processing is done in-house.